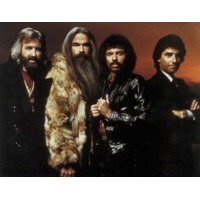 The Oak Ridge Boys is a country and gospel group that is based in the United States. The group was founded in 1945 as the Oak Ridge Quartet. They became popular during the 1950s. Their name was changed to the Oak Ridge Boys in the early 1960s, and they remained a gospel-oriented group until the mid 1970s, when they changed their image and concentrated more on country and pop music. The band's current lineup consists of lead Duane Allen, tenor Joe Bonsall, baritone William Lee Golden, and bass Richard Sterban.